Today starts the official full-time work on the house. Now you're going to see some changes! Michael finished up all his other jobs and today we get the big delivery from the local lumber yard. 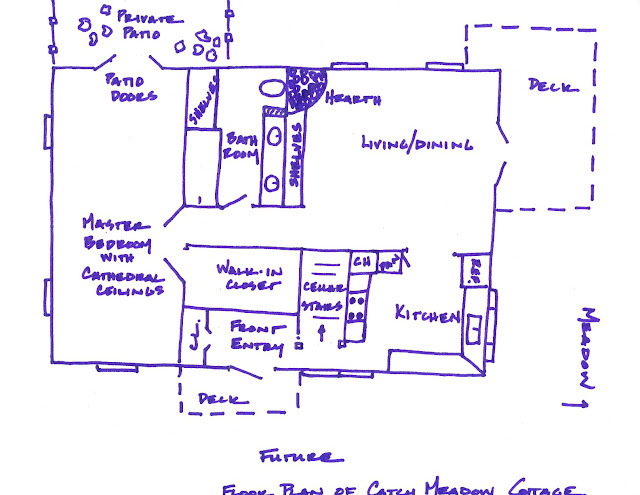 Here are the floor plans of the original house and the plans for the future house. I am not a professional designer or architect so please forgive the drawings. I did a very quick rendering just to give you an idea of how things are going to change. Nothing is accurate and nothing is square but my Dad keeps on insisting I include the plans, so here they are. This is for you Dad! 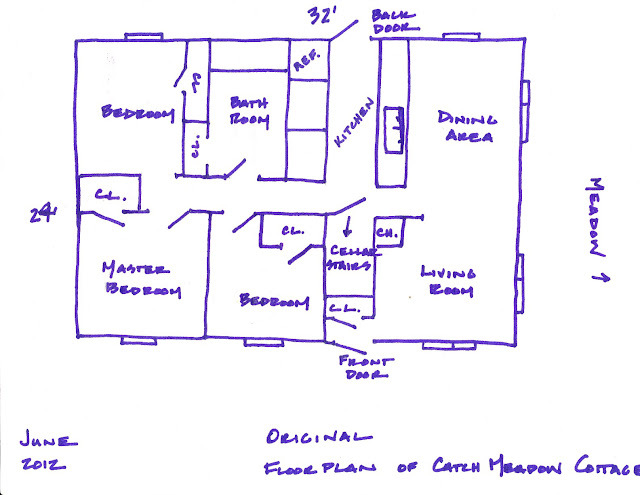 As you can see, the plan goes from a tiny 3 bedroom home to a spacious (you would have to be there to believe it) one bedroom cottage. We are adding a bigger kitchen, living room, bathroom and entry way as well as a huge master bedroom with a walk-in closet. All of this is in exchange for 2 small bedrooms. Don't forget, there is a huge, dry, beautiful basement just waiting to be utilized. That's where we'll add more rooms. I also wanted to point out that in Maine, folks generally enter the house from the kitchen. With snow and mud and dogs, it's best to enter that way rather than through the living room. That's why we flipped the floor plan. We also want to optimize the view of the meadow in the living room with big patio doors. A triple window over the sink will offer the same view in the kitchen. but that's next year's plan. I'll keep you posted on today's progress. Have a happy and productive day!